Military | Aerojet Rocketdyne Holdings, Inc. The military instilled in you a sense of American pride you carry throughout everything you do. The values at the core of the military professional are ingrained in the Aerojet Rocketdyne (AR) Holdings culture. Our daily operations employ these core values across all disciplines. Continue your career with AR Holdings while positively impacting your own career trajectory. AR Holdings is a world-recognized aerospace and defense leader principally serving the missile and space propulsion, and defense and armaments markets since 1942. Long recognized as a developer of new technology, AR Holdings continues to meet emerging defense and aerospace propulsion needs. 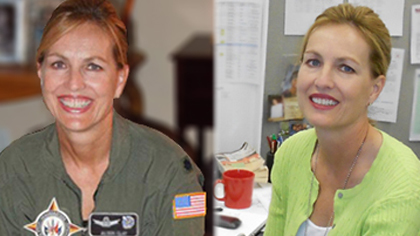 Alison Clay, having served in the military, is now part of Aerojet Rocketdyne’s Staff Action Team and Program Management Center of Excellence. She feels Aerojet Rocketdyne and the military have much in common in that they are both essential to our national defense. "The strength of our military depends upon the strength of our defense and aerospace industries. It’s exciting to see the contributions that we are making in strengthening our defense posture and to be a part of Aerojet Rocketdyne during this time of growth. I am so blessed to live in the United States and am privileged to have been given the opportunity to serve my country – as a member of the Armed Forces, and now, as part of the Aerojet Rocketdyne team. For anyone considering transitioning from the military to Aerojet Rocketdyne, I would say, 'Go for it!' Aerojet Rocketdyne is a fantastic company, which embraces many of the same core values as the military! I’m currently working to find a good fit at Aerojet Rocketdyne for another Air Force Veteran. My work at Aerojet Rocketdyne allows me to support those who are supporting the war fighter." Veterans who would like to contact the Staffing department with questions regarding the application process may email the Human Resources Department at Supportvets@rocket.com.